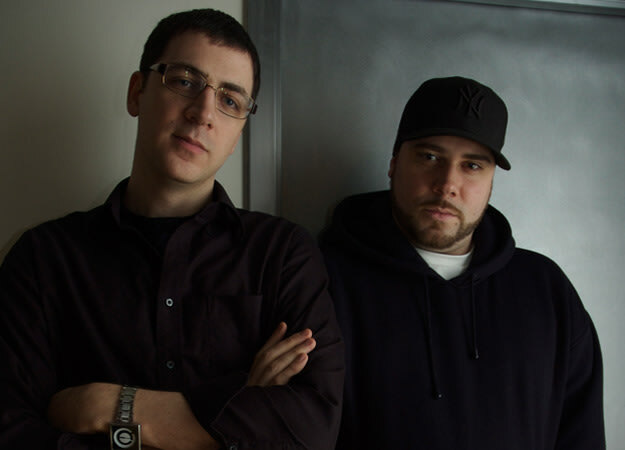 Interview: ILLFONICS Discusses Kid Cudi's "Enter Galactic"
ILLFONICS is Matt Friedman (left) and Jed Cappelli. After this week&apos;s in-depth interviews with RATATAT and Emile, our behind-the-scenes series on Kid Cudi&apos;s Man On The Moon: The End Of Day continues with today&apos;s Q&A subject: Matt Friedman, one-half of ILLFONICS, and the man who produced the &apos;shrooming anthem "Enter Galactic." "Enter Galactic (Love Connection Part 1)"
Complex: How familiar were you with Cudi and his music before working with him? Matt: We knew about Cudi since "Day &apos;N&apos; Nite," whenever it first came out back in 2007. Before Fool&apos;s Gold [Records] even put it out, it was just on Fader.com or whatever when it was first coming out. We were trying to get with him all the way back then and it just didn&apos;t really happen at the time. But then when the mixtape came out, I told my manager Toshi [Kondo], "We need to work with this dude," because creatively there&apos;s not a lot of people doing anything like what he&apos;s doing. Artistically for us, we&apos;ve had a lot of hip-hop placements but musically we&apos;re all over the map, so we always thought it would be a good match to work with Cudi. Then, like almost two years later, around last fall maybe, we kind of touched base with some people that were working with him and started making joints and sending them through and that&apos;s how that [YouTube] freestyle came about. Complex: Right, the "Too Short" freestyle clip. Matt: Yeah. Jon Kaslow, who&apos;s his DJ now, we were all always cool with him, so he would pass Pat and Emile some of our stuff. I made that freestyle track for him, I guess initially he really liked it and mentioned that he probably would end up using it for the album, but that didn&apos;t end up happening. But yeah, we just kept making stuff and got cool with his A&R Nigil [Mack] once he signed a deal over at Universal, because before he signed we were working with another artist over there named Jackie Chain. So once Cudi signed there, we were already cool with Nigil and I think he was the one that passed on the beat that became "Enter Galactic." Complex: When was "Enter Galactic" recorded? How long did the process take? Matt: It must have been recorded in like late June, early July. We sent the track to Nigil and he was like, "Yo, this beat is crazy! Send it to Cudi." I think Cudi cut his vocals that day, he heard it and it just clicked for him. I wasn&apos;t actually there, he just had the track and laid it down. Then we kind of went through this tumultuous period where they wanted it, and then they didn&apos;t want it. They weren&apos;t sure if it was going to fit into the rest of the record. So it kind of went back and forth and then in mid-July, the week before I was about to go on vacation, they decided that they wanted to use it. Complex: What changes did they want you to make to the beat? Matt: They had me come into the studio because the original layout I had was kind of crazy, some parts were kind of long, and the way he laid it down, the middle section just kind of went on a little too long. So we adjusted the layout a little bit and they had me do a few variations of stuff on my own. But the changes I made kind of took it further away from the rest of the album because I hadn&apos;t really heard the rest of the album, so sonically what I was doing was moving away. In the end they just went with the original stuff, the original beat but just the new layout we worked on together. Complex: How do you feel about the fact that "Enter Galactic" does sound so different from the other songs on Cudi&apos;s album? Matt: It&apos;s funny because originally I did make that beat with another artist in mind, a female singer. Then I thought a male singer could really do something on this, but I wasn&apos;t thinking about Cudi when I first made it. Then my manager Toshi was like, "I could definitely hear Cudi on this, I&apos;m going to send it to his A&R." And I was like, "Are you sure?! Really?" [Laughs.] Then I thought about it and I was like, yeah I could hear that too. He was totally right, so it was a good call. Complex: We heard from Emile that Cudi is pretty active in the studio and isn&apos;t afraid to give suggestions to producers. Was that the case for you? Matt: When I went into the studio, he would do that and there were a lot of suggestions, like, let&apos;s try adding this thing here, or maybe take out this kind of thing. With Cudi, Emile, and Pat, they were all there and I tried those things out, but in the end they just went with more of the original [beat]. Complex: Was your experience working with Cudi different than with other artists? Matt: I think that the first thing that stands out to me is just that melodically, it&apos;s almost really like working with a singer. On "Enter Galactic," he mostly just kind of sings, then does some spoken word, then raps, and then goes back to singing. It was cool working with an artist that versatile because a lot of the times when you&apos;re working with rappers or singers, it kind of puts you in the box of what they do. Most artists just do one thing and hopefully they do it really well, but I think creatively he can do a lot of things and it&apos;s inspiring to work with someone like that. Even when we were throwing ideas around in the studio and singing extra lines, the way he hears the music is definitely really cool. Complex: There&apos;s some rumors of "Enter Galactic" becoming a single. Matt: [Laughs.] Uh, I&apos;ve heard some bubbling, I don&apos;t know. I don&apos;t really know what their plans are. I mean I&apos;ve heard online rumors of a bunch of different songs being singles. Hey, I would be excited if it was but I don&apos;t know at this point. Complex: Describe how your partnership with Jed works on a record like "Enter Galactic." Matt: Definitely spontaneous. With "Enter Galactic," I produced that on my own. Some tracks we&apos;ll start together from top to bottom, some tracks one of us will get it going and then bring the idea to the other person and we&apos;ll finish it together. Then some stuff we do completely on our own. We both overlap with what we do. We both play guitar, bass, keyboard, drums, programming, and all that stuff. It really just depends on the record and wherever the idea comes from. Complex: How has your relationship with Jed progressed over time? Matt: There&apos;s really no one way that we work together. Early on we would always be in the studio together. We&apos;ve been working together for 10 years. Originally during production we would teach each other things and build off of each other, but I think as time went on we just got more confident with our own skills. We would start things and bring them along further before bringing it to the other person. I mean we still do stuff together but there&apos;s a lot more of building something a lot further then finishing it together. Then we both started doing joints from top to bottom, on our own, at our own studios. We both have studios with similar setups. That was just the case with the Cudi record. The [Jim] Jones record we did together, our placements with LL we did together. It just really depends. Complex: What are some of the projects you&apos;re currently working on? Matt: I just did a track with Gorilla Zoe, we&apos;re probably going to do a few more tracks with him. We did a track together with Shanell and Gudda Gudda from Young Money that&apos;s hopefully going to be on the Young Money album, it&apos;s a real kind of pop track. There&apos;s a track with Red Cafe, some stuff with Pill and Donnis. We also are producing a remix of Mick Boogie&apos;s upcoming Noisettes&apos; Wild Young Heartbreak project. There&apos;s some TV stuff too, we have a beat that&apos;s going to be on the season finale of Entourage. Just keeping busy. Complex: Your sound is pretty diverse. Is there a particular genre that you prefer? Matt: That&apos;s tough, it&apos;s hard because when you get a track that&apos;s coming together really great—in that moment that&apos;s your favorite track. They can all be exciting and fun. I love doing the pop/rock stuff, but I love doing it all. I think that&apos;s what keeps it fun for us is that we&apos;re not just doing the same thing over and over. If we were just doing a hip-hop beat over and over it would get pretty boring for us. But because we&apos;re bouncing all over the place, it keeps stuff interesting.